Your man's body language may tell you he is distancing himself. If the man you love is distancing himself, you are probably hurt, confused and angry about the fact that your significant other does not wish to get closer to you. You might wonder whether there is a reason behind his actions. 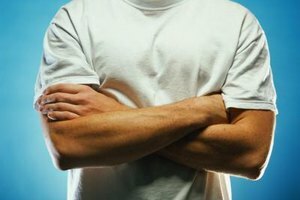 There are a few unmistakable signs that a man is distancing himself, although the reasons behind his behavior are more difficult to determine. A man who is distancing himself from you will show you how he feels with body language. Some signs of distance include crossed arms, eyes that will not meet yours and feet that are faced away from you. Body language tells the truth even when words lie, according to Albert Mehrabian, emeritus professor of psychology at UCLA and author of "Silent Messages." If your man keeps communication short and to the point, he may be distancing himself. If he responds to questions with genuine, sincere answers, he may be trying to deepen your connection. But if he tells you he is already giving you all he can, he is essentially saying "no" to a closer relationship, according to Neil Rosenthal, a licensed marriage and family therapist. You may want more, but if he is not willing to cooperate, you are powerless to change his perspective and must let him do as he wishes. If your man puts an emotional wall around himself because he is afraid of getting too close to you, this does not mean that he is distancing himself because he does not want to know you. Rather, he is afraid of being hurt. Drifting away is normal for a man, even if he is in love, according to Rori Raye, author of "Have The Relationship You Want." However, if your man is not afraid of being hurt, he is most likely distancing himself out of disinterest in your relationship. Have a talk to figure out the reasons behind his behavior. If your man prioritizes spending time with his other friends over nurturing your relationship, he is distancing himself. Leaving work and heading somewhere to spend time with other people is a sign he does not want to come home. You may ask him why he prefers being around other friends, and why he does not enjoy being at home. Avoiding your company is a telltale sign that he is distancing himself from a closer connection. Denver Post: When he distances himself, what should you do? Self-Growth: He's Distancing Himself! What Does it All Mean?